CJ Cansino isn’t playing like a rookie. 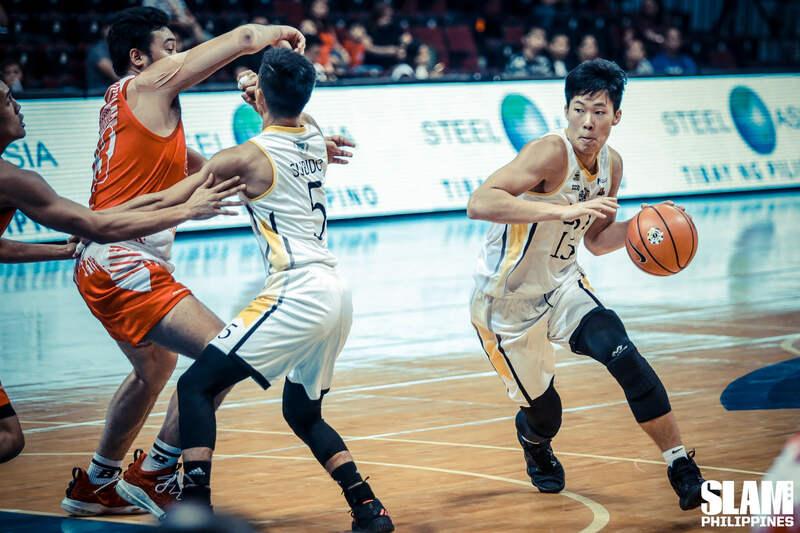 The young wing of the UST Growling Tigers stepped up once again in their win over the UE Red Warriors. Cansino scored 17 points and hauled down 17 rebounds to help his team get their second win of the season. Renzo Subido led the Growling Tigers in scoring with 22 points. The Growling Tigers found their range early to pull away from UE. Zach Huang, Cansino and Subido all nailed three-pointers in the opening minutes to set the tone for the game. UST continued to make it rain from beyond the arc in the second period when they pulled away from UE.The Growling Tigers were money from the left corner as Marvin Lee, Ken Zamora and Cansino all buried shots from the same area to build a 16-point lead heading into the half. After a horrible second quarter where his team could only manage six points, Alvin Pasaol tried to carry UE out of another big hole. He erupted for 23 points in the second half as the Red Warriors improved their effort. UST was just sizzling. They repeatedly dropped bombs from beyond the arc to stave off the UE rallies. The Growling Tigers shot only 28% from inside the arc. But they made up for it by hitting 16 treys at a 47% clip in the game. The Ateneo Blue Eagles continues to roll in Season 81. Their latest victims was their rival, the La Salle Green Archers. 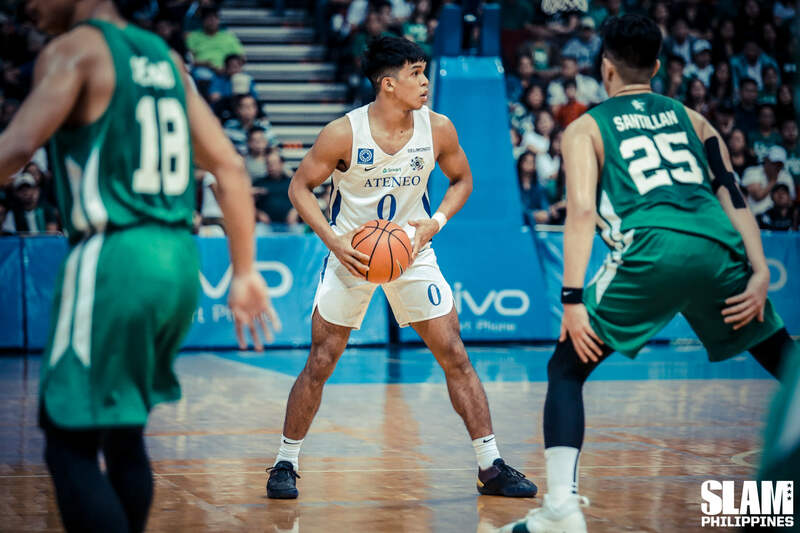 Ateneo blew out the Green Archers for their fourth straight double digit win, en route to their fifth straight win of the season. Angelo Kouame filled up the stat sheet with 20 points, 13 rebounds, three steals and five blocks. The wounded Archers were able to keep up with the defending champions in the first half. Aljun Melecio and Mark Dyke teamed up to give La Salle a on-point lead in the first period. The Ateneo defense turned up the pressure in the second quarter. They forced La Salle to several turnovers which resulted in buckets on the other end. Thirdy Ravena, Will Navarro and Kouame powered Ateneo to a 12-0 run late in the second period to take over the game. Ateneo forced La Salle to 16 turnovers in the first half. The Blue Eagles continued to roll in the second half. Ateneo’s bench came alive in the third quarter as Raffy Verano, Isaac Go, Mike Nieto and Tyler Tio all got on board. Tio’s 5-0 blast to end the third quarter gave Ateneo a 17-point lead. In the final period, Kouame put the finishing touches on the win with a couple of highlight plays. He took the ball coast-to-coast on a rebound for a euro step and-one bucket. Near the end of the game, Kouame got the steal and took it all the way to the other end for a two handed exclamation point.